Last Chance is a dice game that was originally released back in 1994 by Milton Bradley. Last Chance took a more traditional dice rolling game and added in some betting mechanics. 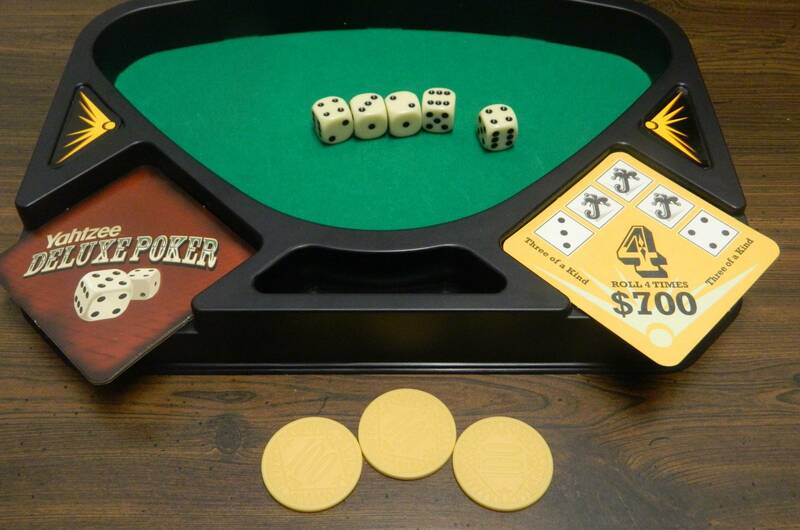 While the game was only reprinted once in 1995, it eventually came back to life in 2005 as Yahtzee Deluxe Poker. Outside of a new coat of paint and a new name meant to appeal to the masses, Yahtzee Deluxe Poker is basically a reprint of Last Chance. Having reviewed over 40 different dice games I can’t say that I had super high hopes for Yahtzee Deluxe Poker and Last Chance since it mostly felt like they took a generic dice game and added in some basic betting mechanics. Yahtzee Deluxe Poker and Last Chance have some interesting mechanics courtesy of the betting mechanics but they still fail to be anything more than very average dice rolling games. Shuffle the 36 cards and randomly choose seven and place them on one side of the tray. 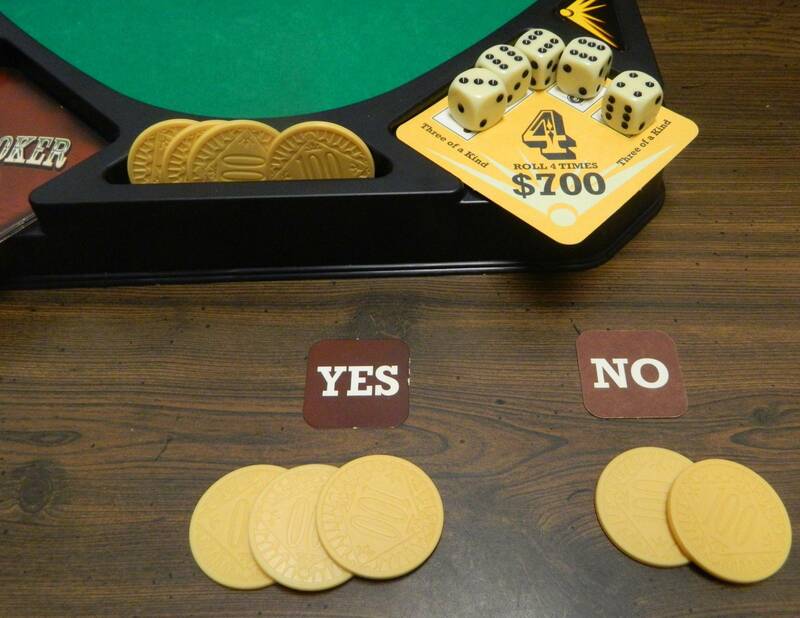 Each player takes one of the yes/no tokens. Each player also takes 5 $100 and 2 $500 chips. The owner of the game will begin the bidding in the first round. The game is played over seven rounds. Each round begins with the top card being flipped over. This card will show five dice. One of the players will have to roll the combination of dice pictured on the card this round. For the jokers pictured on the card, the player can use any number not already pictured on the card. All jokers must be the same number though. 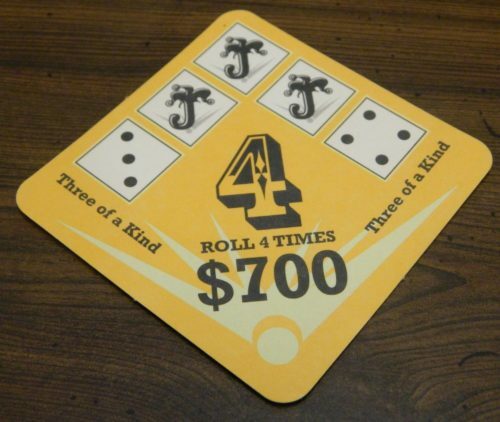 The large number on the card indicates how many rolls the player will get to meet the combination on the card. The payout value is how much the player will receive from the bank if they are successful. For this card the player that bids the highest will have four rolls to roll one three, one four, and three of another number. Starting with the first player players will bid for the opportunity to roll the dice. Players can bid in any order but all bids must raise the bid by at least $100. A player is unable to bid higher than the amount they have in chips. The player who bids the highest will get the opportunity to roll the dice. They will place their bid in the slot in the tray. If no one bids the first player gets to roll the dice without having to bid anything. This player has decided to bet $300 for the opportunity to roll for this card. Each player also has the opportunity to go “all-in” one time during the game. When a player goes all in they will bet all of the chips they have left. This bid automatically wins the right to roll even if another player had already bid higher. After the players decide who will be rolling the dice, the rest of the players can bet on whether they think the player will be successful. The player can either bet “yes” that they think the player will succeed or “no” that they will fail by turning their token to the corresponding side. The player can wager between $100 and $300 on this bet (between $100 and $1,000 in Last Chance). The player on the left has bet $100 that the player will succeed in completing the card. The player on the right has bet $300 that the player will fail. The player who won the right to roll, rolls all five dice into the tray. Any dice that land outside the tray or are leaning against one of the sides are re-rolled. Any dice that are rolled that match one of the numbers on the card are removed from the tray and are placed on the corresponding spots on the card. For jokers the player can choose which number they want to use that isn’t otherwise shown on the card. 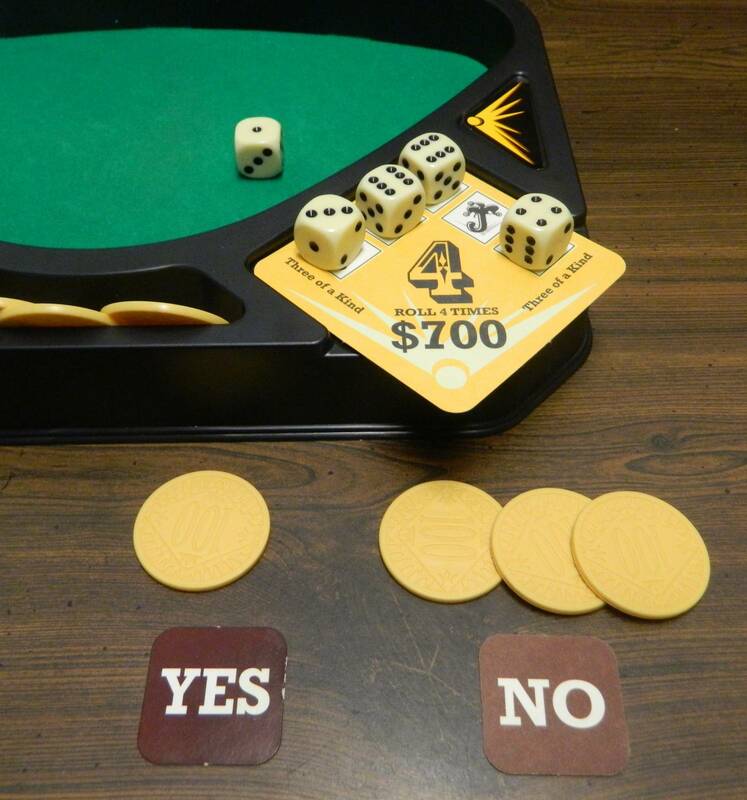 The player can choose to add a die to a joker space or can wait for a future roll. On this player’s first roll they rolled the three that they needed for the card. Since they rolled two sixes they have decided to use sixes for the joker. The player then rolls the rest of the dice up to the number of times indicated on the card. Once a player has rolled the dice the corresponding number of times, the players will check to see if the card was successfully completed. The player loses all of the money they bet to the bank. All of the players who bet “yes” will also lose their bet to the bank. The players who bet “no” will take back their bet and receive the same amount from the bank. All of the dice remain on the card. The players will then return to the bidding step where players will bid on completing the rest of the card. The player who failed will get to start the bidding. This player has failed to complete the card in four rolls. They will lose the money they bet in order to roll for the card. The player who bet yes will also lose their $100. The player who bet $300 will take back their $300 and receive another $300 from the bank. The player collects the card and places it in front of them. The player will also take their bid back and collect the corresponding reward from the bank. The players who bet “yes” will take back their bet and receive the same amount from the bank. The players who bet “no” will give their bet to the player who completed the card. The next card is flipped over and the next round begins. The player has successfully completed the card. They will get to take back their bet of $400 and will receive $700 from the bank. The player on the left bet yes so they will take back their bid and will receive an additional $300 from the bank. The player on the right bid wrong and will give their $200 to the player who completed the card. If a player ever runs out of money they are immediately eliminated from the game. The game ends after seven rounds. If a player has not collected a card during the game they have no chance of winning the game. The rest of the players count up how much money they have. The player with the most money wins the game. The player on the left has $3,200 while the middle player has $2,700 and the right player has $2,200. The player on the left has won the game. For reference this review is going to be based off of playing Yahtzee Deluxe Poker. As I will talk about later there are so many similarities with Last Chance that basically the two games are pretty much the same with only slight differences between the two games. Therefore my observations about Yahtzee Deluxe Poker should also apply to Last Chance. So I am going to preface the rest of the review by saying my group had dreadful luck while playing the game. At one point it took us around 20 rolls to roll just one number that we needed to complete one of the cards. This really defies the odds since you have a one in six chance of rolling any individual number. Having better luck might have slightly changed my thoughts about the game but I still believe most of my thoughts would have stayed the same. Before playing Yahtzee Deluxe Poker I have to say that I didn’t think it wasn’t going to be that hard to roll the combinations on the cards. Therefore I and another player actually bid a decent amount in order to have a chance to roll for the cards. This backfired immediately as I and the other player quickly went bankrupt as we kept failing to complete the cards. Since it wasn’t going to be fun playing the game with half of the players just sitting there we decided to reset the game. This second time I played a lot more conservatively bidding only one or two hundred for the first chance to roll the dice. The reason I drastically changed how much I bid for the first chance at rolling is that it is generally not a good bet. While I will attribute this somewhat to our terrible luck, I don’t think the odds of completing a card on the first set of rolls is particularly high. On average you only have around three rolls to complete one of the cards. I think the main reason that the cards are so hard to finish on your first attempt is that most of them ask for pretty specific sets of numbers. This limits the amount of flexibility you have. While the odds of completing the card on the first attempt are low, the potential return from completing the card if you didn’t bet much is extremely high. After the first player likely fails to complete the card things get more interesting. Once a player fails all of the dice they successfully rolled stay on the card which makes the odds significantly higher on future attempts at the card. At this point the betting becomes a little more interesting. When you have several rolls to get just one number it becomes more enticing to bet higher for the chance to roll the die. While our game proves that rolling only one die doesn’t immediately improve your odds, players are more likely to bid which makes it more interesting to determine how much you should bet for any individual card. While only one player will get to roll the dice, I want to give Yahtzee Deluxe Poker some credit for keeping all of the players (who haven’t already been eliminated) involved in the game. When a player wins the bet to roll the dice, the other players have an opportunity to bet on whether that player is going to succeed or fail. While there is a limit on how much you can bet ($300 in Yahtzee Deluxe Poker and $1,000 in Last Chance), this mechanic can actually play a big role in the game. It is even possible to make more money betting in this way than actually trying to complete the cards. Bet against the players a couple times and you could earn more than if you had won the card. Since players are going to regularly fail you are going to want to bet against the players since it is usually a good bet. The game tries to combat this by forcing you to pay your bet to the player if you bet against them and they end up succeeding. Generally I would still recommend betting against the player unless they only need to roll one or two dice. While I think these side bets might be a little too valuable, I give the game credit for preventing players from sitting out the entire game. In order to have a chance of winning the game, you have to win at least one of the cards. I like this rule since it forces players to take some risks instead of just sitting on the sidelines watching the other players play the game. If it wasn’t for this rule I honestly think you could win the game not trying for any of the cards and instead just betting against the other players. 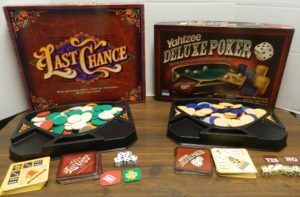 If it isn’t already clear, Yahtzee Deluxe Poker and Last Chance are pretty generic dice games that have added a betting mechanic. If you took out the betting mechanics you would basically be left with Yahtzee and many other dice games. I will say that the betting mechanics do add quite a bit to the game. While the game relies pretty heavily on luck (due to the dice rolling), the betting mechanics do add some strategy as you can try to play the odds when making your bids. The betting mechanics are not particularly complex but Yahtzee Deluxe Poker succeeds at being a dice game that you can quickly pick up and play. If you like these type of simple dice rolling games I think you can have fun with the game. While I had some fun with the game, the fact that the game doesn’t do anything highly original is the biggest problem that I had with the game. Yahtzee Deluxe Poker and Last Chance are very average dice rolling games. If you don’t like basic dice rolling games you are not going to enjoy them. Even if you like dice rolling games there are games out there that are much better. Some pure dice rolling games that I enjoyed quite a bit more include Combo King and Take It or Leave It. You can have fun with Yahtzee Deluxe Poker and Last Chance but there is nothing special about either game. The challenge cards in both games are exactly the same except that the payout amounts in Last Chance are higher than they are in Yahtzee Deluxe Poker. The amount players can bet on whether a player will succeed is also higher in Last Chance at $1,000 instead of the $300 you can bet in Yahtzee Deluxe Poker. The chip counts are slightly different between the two games. Last Chance includes $10,000 chips which Yahtzee Deluxe Poker does not include. There are also one or two chip differences in some of the other denominations. The theme/component design are different between the two games. With only these three slight changes between the two games, they truly are basically the same game. If you are interested in the game, you should probably purchase the game that you can get a better deal on. In the gameplay department the only difference is that you will end up with more money in Last Chance which feels nice. I highly doubt it has any noticeable difference on how the game is played though. As far as the components I would say that the components for both games are solid but unspectacular. Of the two I would say that Last Chance wins on the quantity front while Yahtzee Deluxe Poker wins on the quality front. Last Chance actually gives you quite a few more chips that Yahtzee Deluxe Poker. While there is nothing wrong with Last Chance’s quality, I just like Yahtzee Deluxe Poker’s style more. Both games are pretty typical quality for a Milton Bradley/Parker Brothers/Hasbro game. One problem that I had with both games though is that I didn’t really like the tray. The problem with the tray is that the dice just don’t roll that well in it. I honestly would consider just rolling the dice outside of the tray. Should You Buy Yahtzee Deluxe Poker AKA Last Chance? At first sight Yahtzee Deluxe Poker and Last Chance looked like pretty average dice rolling games with some betting mechanics added in. While that is an oversimplification it is actually a pretty accurate description of the games. The dice rolling mechanics are basically what you would expect from almost every other dice rolling game where you are trying to roll different number combinations. While the betting mechanics are far from complex, they actually add a decent amount to the game. While it is not a good idea to bet much for the first chance to roll for a new card, the bidding becomes more interesting after some of the card has already been completed. Players are also given the opportunity to bet for and against the other players. 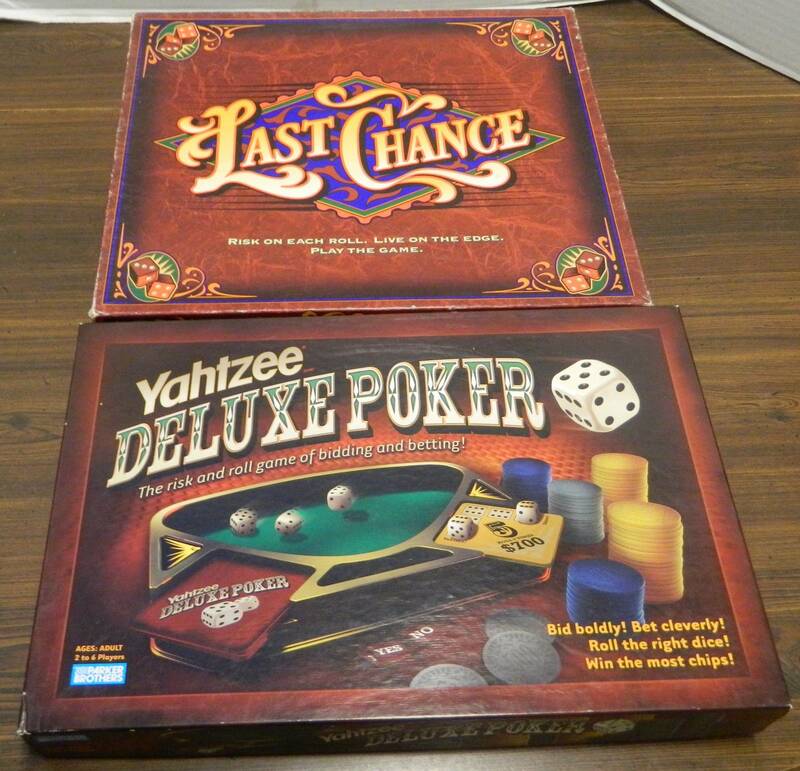 Yahtzee Deluxe Poker and Last Chance are solid dice games that you can have fun with but in the end are nothing more than very average dice rolling games. 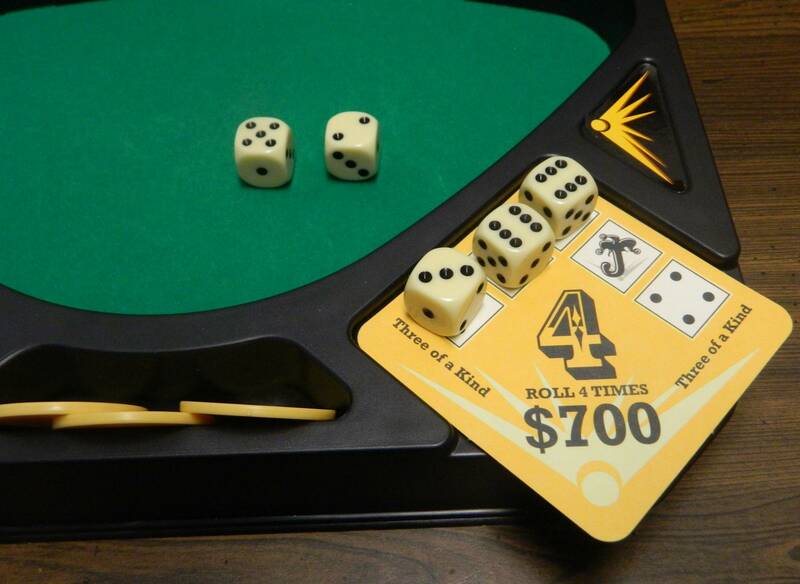 If you don’t like dice rolling games you will not like Yahtzee Deluxe Poker or Last Chance. If you already have a lot of dice rolling games I don’t think either game are special enough to warrant a purchase. If you are looking for a new dice rolling game with some betting mechanics though you can do worse than Yahtzee Deluxe Poker or Last Chance. Which version of the game you should purchase mostly comes down to price as they are basically the same game. Bidding for the chance to roll for the reward is an interesting idea. Adds some strategy to the game through the bidding. Is a pretty average dice rolling game. Surprisingly hard to complete any card on the first or second opportunity.